Batukaru Temple Bali (Indonesian: Pura Luhur Batukaru) is a Hindu temple which is set exactly right on the slopes of Mount Batukaru in the western area of the island of Bali, Indonesia. Information about the history of Batukaru temple is very little and is not known for sure who is the founder and when was it built, but Batukaru temple is included in one of the six main temples (Sad Kahyangan) in Bali island as described in Kusuma Dewa papyrus manuscript. Batukaru temple has already existed in the 11th century AD contemporaneous with Besakih temple, Lempuyang Luhur temple, Goa Lawah temple, Uluwatu temple and Pusering Jagat temple. The initiator of the establishment of Sad Kahyangan is Mpu Kuturan. After the existence of Batukaru temple in the 11th century, and then we did not get a clear description of how was the state of the temple. Only in 1605 AD, there was a description from the book of Babad Buleleng, in the book explained that Batukaru temple was marred by the King of Buleleng named Ki Gusti Ngurah Panji Sakti. In the book of Babad Buleleng is described that the kingdom of Buleleng is very safe and there is no enemy would dare to attack it. The King wants to expand its territory to Tabanan area. King Ki Gusti Ngurah Panji Sakti on his way to Tabanan meet Batukaru temple which is a territory of the Kingdom of Tabanan. Ki Gusti Ngurah Panji Sakti together with his soldiers then undermine the temple. When Ki Panji Sakti and his soldiers do damage in Batukaru temple, then suddenly came thousands of wasps to attack and sting them. Ki Panji Sakti and his soldiers were attacked severely by vicious wasps, and then Ki Panji Sakti and his soldiers withdrew and canceled the plan to attack the kingdom of Tabanan. Because of their acts, then the condition of Batukaru shrine buildings was totally destroyed and only ruins remaining. Then in 1959 Batukaru temple get repairs so that the shape as what we see today. In 1977 there is attention and assistance from the local government gradually and until now the circumstances and conditions of Pura Batukaru are getting better. Besides having the main building, in the eastern part of the Batukaru temple there is also temple and springs which consist of two parts, the spring located inside the temple (Jeroan) which is used specifically to invoke the holy water (tirtha) for ceremonial purposes, and the spring located outside the temple which is used to wash face and shower as cleansing before praying. In this temple, Dr. R. Goris, an expert in the science of archeology, has conducted research in 1928. Goris met many statues similar to the statue of its kind available in the Goa Gajah Temple like statues that spouting water from its navel. The difference is that the sculptures found in Goa Gajah temple are in a standing position, while in Batukaru temple is in a sitting cross-legged position. According to Goris, the figurines found in Batukaru is contemporaneous with the sculptures found in Pura Goa Gajah. 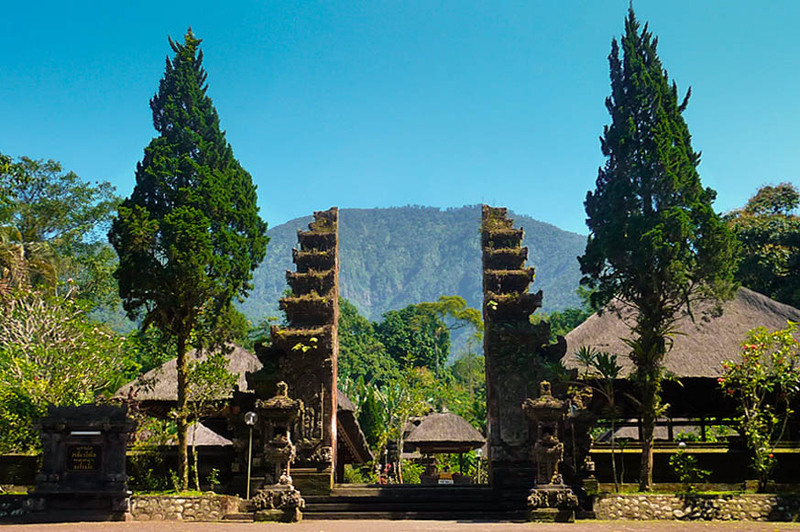 Batukaru temple possibility previously has been used as a place of worship and a place for meditation by spiritual figures in the Tabanan area and Bali in general. This presumption is based on the discovery of water sources with different types of shower statues. Of the sources of these springs can be concluded that the area was once used as a meditation place for ascetics (Wanaprastin) to find their peace life. Most temples in Bali are shaped like multiple roofed towers, it's similar in design to Chinese or Japanese pagodas (in Balinese is called Meru). But the main sacred building (Pelinggih) in Pura Batukaru is not like Meru but it's mostly like a vertical tower shaped like a pyramid pointed upward. This is very clearly influenced by the architecture of East Java and India. The ceremony of Batukaru temple is held in every 210 days that is on every Thursday, wuku Dungulan (Balinese calendar), one day after Galungan day. One thing that is unique in Pura Luhur Batukaru is at the time of the ceremony or the other great ceremonies are never led by a priest (Pedanda/Pandita). The ceremony is led only by Pemangku called Jero Kubayan. For those who want to pray to Batukaru temple is highly recommended to pray first in Pura Jero Taksu temple. Jero Taksu temple is located a bit away from Batukaru temple. The purpose of praying in Jero Taksu Temple is to invoke that the process of prayer which will be done later in Batukaru Temple will get success and without obstacles. Jero Taksu temple is part of Batukaru Temple. Afterward, then headed to the showers of spring that is located in the southeastern part of the main temple, but remain in the area of Batukaru Temple. The Shower of this spring is intended to purify ourselves by washing face and washing feet followed by praying at the shrine in the spring as a sign of purification of the inner and outer or the seen and unseen (Skala and Niskala) as the main requirement for worship can be done with physically and spiritually clean and pure. Pura Luhur Batukaru is a holy place of worship the God in His manifestation as Lord Mahadeva (Mahadewa). Because its function is to worship God as the God who cultivate plants, then at this temple is referred to as the worship of the Lord as Ratu Hyang Tumuwuh (designation of God as the God who cultivate plants). Batukaru Temple is also included as Padma Bhuwana Temple, Padma Bhuwana Temple is nine temples located in nine parts of the island. Pura Padma Bhuwana as a symbol of worship of God that exist everywhere in the nine corners of the universe. No part of this universe without God's presence. The existence of God as that expressed in the nine temples in Bali.